Zygomatic bone is an important face area since it defines its contours and shape. Increasing the volume of the zygomatic area redefines your face shape and makes it more well-proportioned. The increase in volume is done through injections of hyaluronic acid in the dermis or in deeper areas (for larger skin volumes). Our business philosophy is based on maintaning face natural proportions, so that the final results after the treatment do not look fake or exaggerated and appear as a natural improvement of face features. Hyaluronic acid is reabsorbable and the treatment is 100% reversible, painless and without any side effects. Hyaluronic acid is used not only for cheekbones augmentation for also as a lip filler. 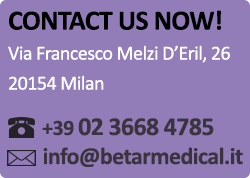 info@betarmedical.it | Betarmedical is an aesthetic medical center in Milan - Italy.